Kristina Wong is a third generation Chinese American, born in San Francisco and living in Los Angeles. Her work encompasses original solo performances, comedy, personal essays, acting, short films and textile work. She was recently featured in the New York Times’ "Off Color" series that “highlight[ed] artists of color who use humor to make smart social statements about the sometimes subtle, sometimes obvious ways that race plays out in America today.” She has created five solo shows and one ensemble play that have toured throughout the United States and the United Kingdom. 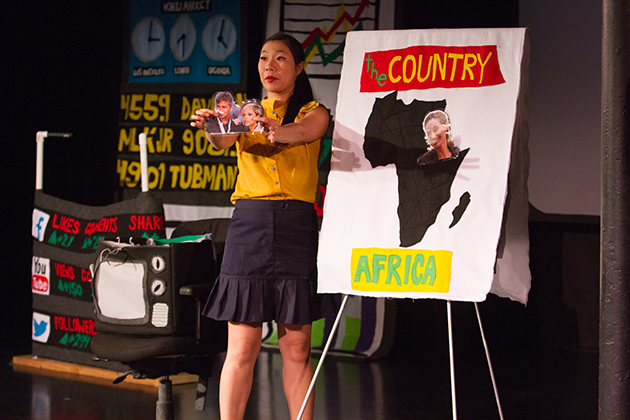 Her longest running touring show, Wong Flew Over the Cuckoo’s Nest, looked at the high rates of depression and suicide among Asian American women and toured to over 40 venues since 2006. It’s now a broadcast quality film distributed by Cinema Libre Studios. Kristina’s been a commentator for American Public Media’s Marketplace, PBS, Jezebel, xoJane, Playgirl Magazine, Huffington Post, CNN and a guest on Comedy Central’s “The Nightly Show with Larry Wilmore” and FXX’s “Totally Biased with W. Kamau Bell.” Her work has been awarded with grants from Creative Capital, The Map Fund, Center for Cultural Innovation, the Durfee Foundation, National Performance Network, five Artist-in-Residence grants from the Los Angeles Department of Cultural Affairs, and a residency from the MacDowell Colony. Kristina has twice given the commencement speech at the University of California, Los Angeles, her alma mater. She graduated with double degrees in English and World Arts and Cultures with a minor in Asian American Studies. She is also trained as an actor at the Steven Book Studios and improvisation at the Upright Citizens Brigade. Television credits include General Hospital, Nickelodeon’s “Nicky Ricky Dicky and Dawn,” and Myx TV’s “I’m Asian American and Want Reparations for Yellow Fever.” This Fall, she is a guest professor at California Institute for the Arts in the M.F.A. Creative Writing Program. Her mail order bride site is www.bigbadchinesemama.com. I believe that as an artist, my job is not to “fix” the wrongs of the world with easy answers, but instead, to further complicate the question by making the invisible visible, and hopefully, creating some space for public discourse. I would describe my aesthetic at its best as subversive, humorous, and endearingly inappropriate. My non-traditional, multi-disciplinary approach logically mirrors my own multi-layered identity that has been influenced by innumerous cultures, religions, political thinking, technology and post-modern performance art. My nebulous identity continues to shift within the communities I live, evolve and interact with. I see my performance work as a humorous and ephemeral response to the invisible and visible boundaries that shape my world, rather than a hermetic declaration of my identity. I’m interested in guerilla performance as culture jamming– creating performances that subvert the use of space not intended for “performance.” I experiment with interactive, improvisational performance that blurs the roles of “artist” and “audience”— recasting unsuspecting bystanders as co-stars to my performance personas -– unearthing the masks, disguises and performances hidden in the most mundane of daily life. I adore “culture jammers.” Some of my favorites are the street interventions of Michael Moore, the “identity corrections” of the Yes Men, and the feminists who crashed television beauty pageants when I was growing up. Their performances are disguised within daily life to subvert, manipulate, and explode the status quo. I also appreciate the simplicity and elegance of interactive work like Yoko Ono’s. Much of my own guerilla theater work similarly offers social commentary and bypasses theaters and galleries—staged on the internet or alternative spaces. My theater work is informed by my site specific performance sensibilities. In my theater work, I challenge my relationship as a performer to my audience. I also confront the expectations of my genre and my subject matter within the work. My stage performance work differs from the Eurocentric theater traditions of 19th and 20th Century American Realism where actors apply “realistic” emotions to pre-written scripts. I see my “characters” as archetypal extensions of my own persona. I almost always break the fourth wall and let my audiences inform the direction of the show. My creation process is very organic. Some of my shows are living ritual exercises with the audience. I find that pre-scripting my work line-by-line at my computer and then rehearsing emotion into those lines is a very confining process. I prefer to generate lists of ideas and doodles, talk them out with trusted collaborators, improvise with a mix of media during rehearsals and then string up the best moments in a logical (or illogically logical) order for public performance. Some of my scripts actually look like a set list that a stand-up comic would use. "The Wong Street Journal" - the Sizzle Reel! Political Performance Art Comedy!